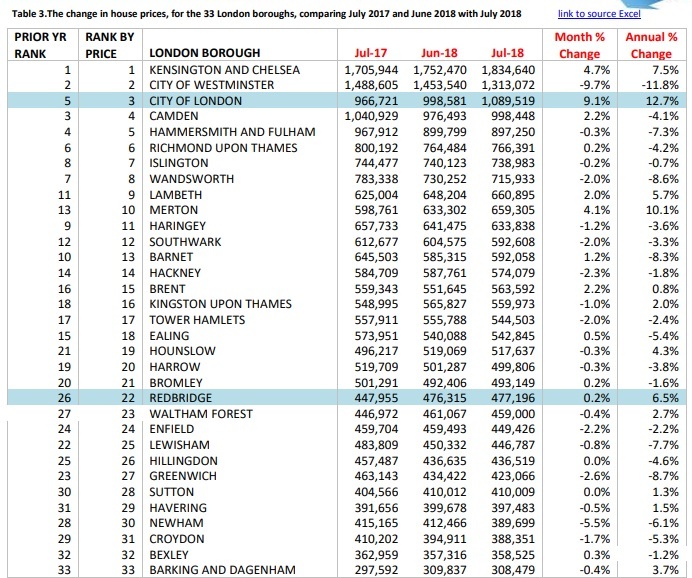 Latest house price data shows Greenwich borough is seeing some of the biggest house price falls in London. This data is from LSL, who along with the Land Registry include some of the most comprehensive sources of information when compiling reports. LSL are quicker to pick up changes and trends with new build prices compared to the Land Registry, and that is likely what is leading the way with these falls. It also measures more transactions than indexes such as Halifax or Nationwide. Greenwich is in the top five authorities in London for new build homes, which is what has brought so much income to the authority from the New Homes Bonus and Section 106 / Community Infrastrucure Levy. Yet in recent months the new build market has seen some upheaval. Many homes are bought off-plan by overseas buyers who only pay the initial deposit and then hope to “flip on”, aka sell, before completion for a quick profit. This has backfired and there are question marks over the ability of these “buyers” to ever complete beyond the initial deposit. As some run away, price falls pick up which LSL are capturing before other indexes. This is one factor with some major housebuilders announcing big cuts in future building plans despite the severe need for homes. With prices so high, and in particular ratios of earnings-to-house prices now putting even small flats beyond people earning average or above wages, developers have become ever more reliant on overseas money and speculation or props such as Help to Buy, which they used to increase asking prices pushing affordability even further away from many. The market is fundamentally flawed when domestic demand cannot sustain building despite huge need. All those props and schemes had a shelf life, and it could well be that the limit has been reached. Add in wider economic issues, Brexit and the rest and price drops shouldn’t be a great surprise. The issue is what happens now. Does the Government and Bank of England introduce more schemes to hold up prices and fuel generational inequality, or stand back? There’s only so long they can intervene and continue to open the credit taps. The more they do, the more people forced into expensive private rents, and those people generally don’t vote Tory. Governments have a habit of propping up private businesses, so despite warnings of a property price crash I don’t think it will happen. It’s a pity as I am looking for somewhere to buy and a ‘crashed property’ would be right up my street. Ha, ha. Many people seem incredulous that prices can drop. It’s as though they have no knowledge that any boom invariably has a pop. See the 1980s, 1990s and 2007-10. Admittedly after that Government went crazy to intervene in the market (the tories a free market party? ha!) but there’s hardly no precedents. And you can generally use tricks only once. After 2007 we had interest rates drop from 5% or more to 0.25%. Also banks pumped with funds. Encouraging foreign buyers with huge wealth instead of local buyers. Turning a blind eye to dodgy money flowing into London from Russia, Middle East and more. Yet the props are running out and Londoners getting further and further away from buying without radical change (and price drops). Start increasing interest rates (slowly) which will give better returns for savers (especially those who have retired), which means people are not throwing moeny on property to chase a return on their savings (I get a return of around 1% on a savings account, where as inflation is higher)! Let the air come out slowly from the housing market bubble. This may be bad for some owners, but better for the overall balance of the overall economy and working class/those trying to get on the housing ladder.